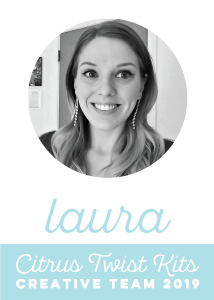 Hey friend, it's Laura Rahel from https://www.laurarahel.com. 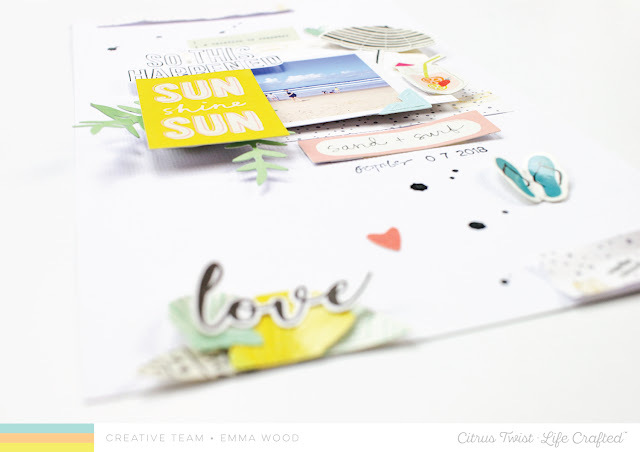 Today I've got a gorgeous traveler's notebook scrapbook page to share with you that I made for my CTK Life Crafted album using the April Life Crafted kit. 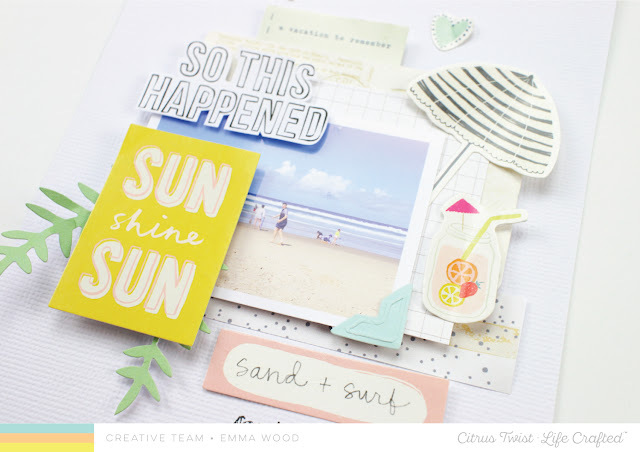 The kit this month have the most gorgeous pastel colors and I took full advantage of that in this layout- all the pastel pinks and greys! Make sure to watch the process video to see how this page was created. One of the fun challenges for me this month was seeing how I could use the kit because it is coffee themed and I don't drink coffee (or tea.) I always love seeing how I can use products from one theme for a different purpose (like using non-Christmas products in a Christmas layout.) 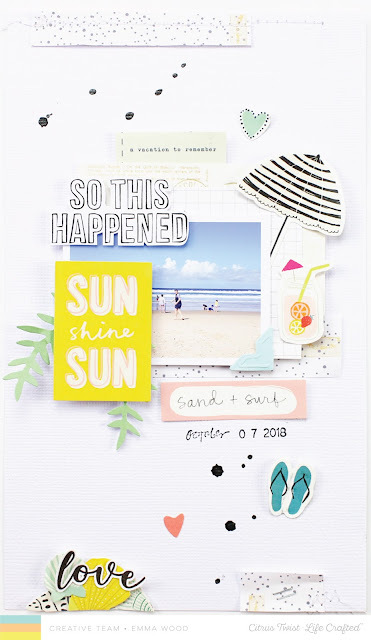 As you can see, this finished traveler's notebeook page has nothing to do with coffee but was made using the Make it a Venti Life Crafted kit, proving how diverse the kits can be. 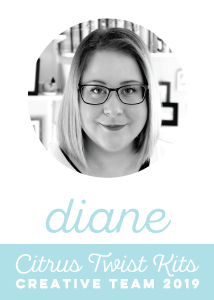 I hope you've enjoyed this look at my process, make sure to follow me on YouTube so you don't miss any of the fun projects I make with the kit this month. Hope you're feeling inspired to scrapbook! 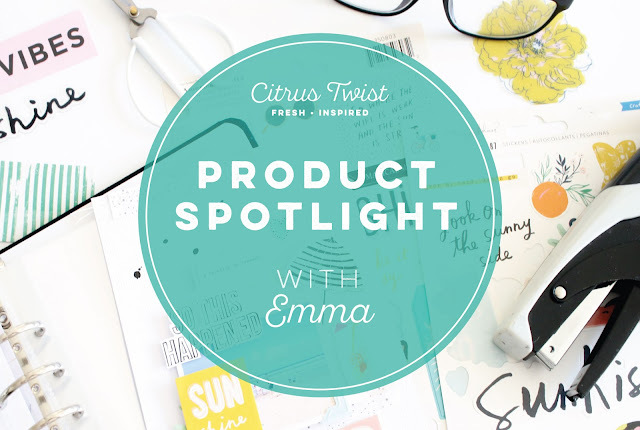 Emma on the blog today and I am so happy to be able to share one of my projects using the April kits. For this layout I wanted to focus on using the fun Maggie Holmes Sunny Days Accent Stickers that are included in this months Add-on Kit! 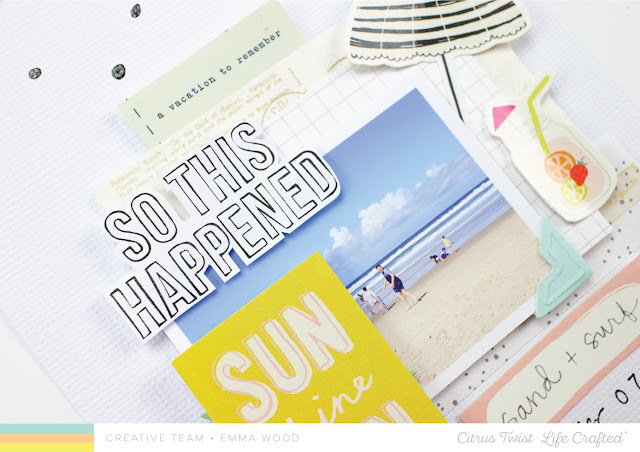 This is sized to fit in my Life Crafted album and as usual I've gone with a white cardstock background (I just can't break out of the habit!). 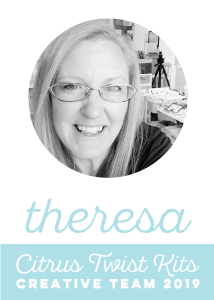 I added a few black ink splatters at the top and bottom of my page and centered my photo. Once I had my photo cluster all set I had some fun picking out my favorite stickers to add around it. That yellow "sunshine" sticker was a must have but I wanted to add a bit more dimension (rather than have it stick straight onto the photo) so I added a scrap bit of paper behind then used a foam-dot to give it some depth). 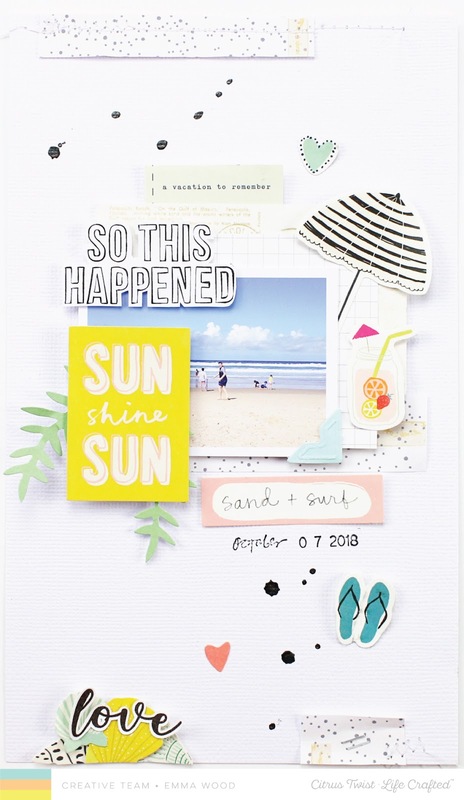 The "so this happened" title is actually from the digital journaling cards - I just pulled the words out and re-sized it to fit my page then fussy-cut around the lettering - super easy! The stickers are such a quick and easy way to add dimension to the page - and I'll often bend them up slightly on the edges just to give the page a bit more movement (like the yellow sticker, I'll add a bit of scrap paper behind to stop the sticker sticking properly!). 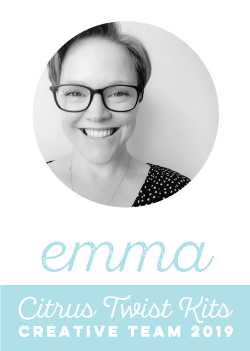 To fill a bit of the white space at the top/bottom of my page, and to balance things out, I've used a bit more of the digital paper I'd printed (I just printed it onto plain copy paper so it's nice and thin!). Love how this one finished up and even though I've used all those stickers I've still managed to create a page with lots of dimension! 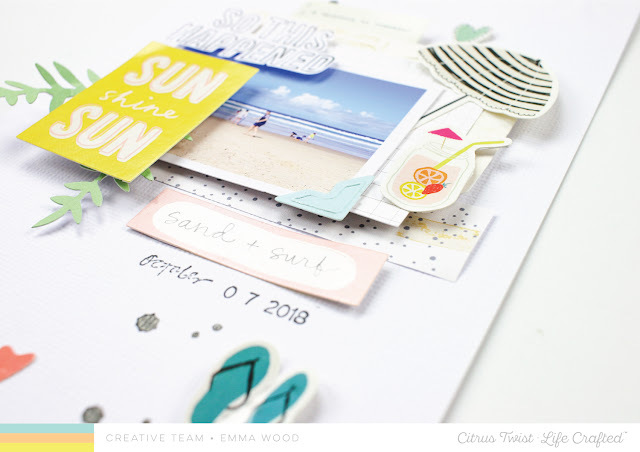 Thanks so much for joining me on the blog today - I hope this will inspire you to use those fun stickers on your projects! More caffeination using cut files! Hi guys! 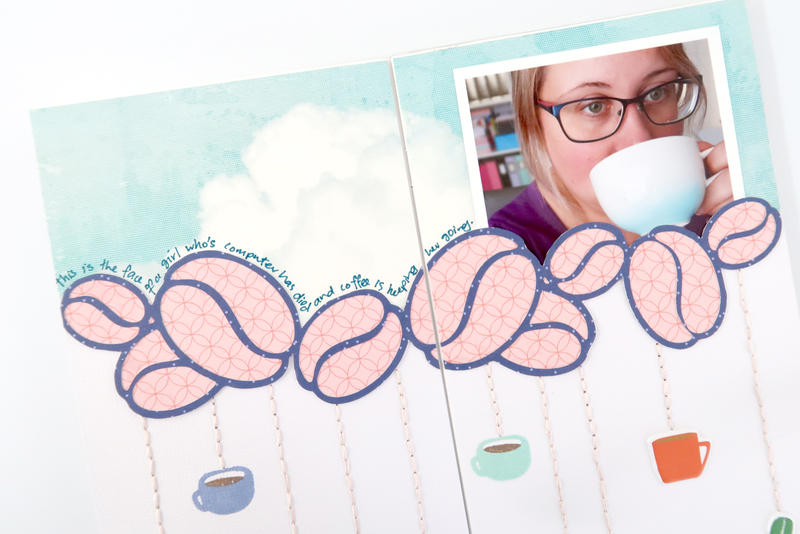 I've got one more caffeine themed project to share with you today, this time in my Traveler's Notebook! 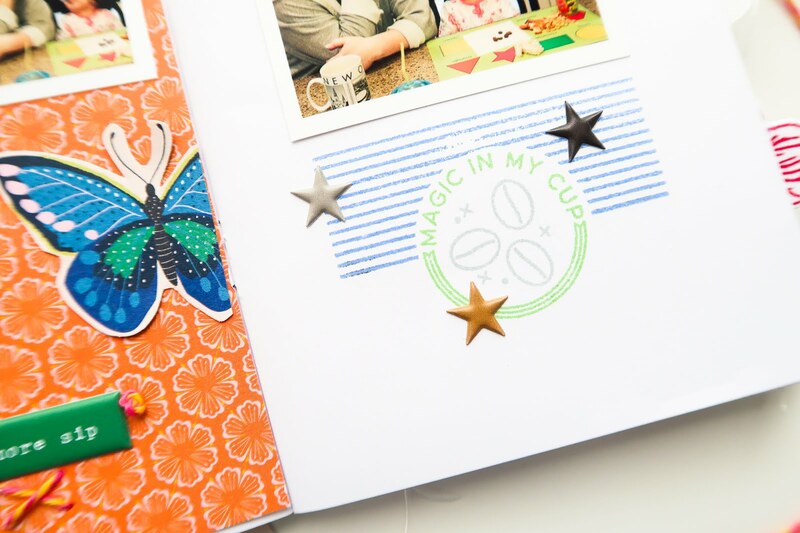 One again, I used that amazing stamp and some puffy stickers from the MAKE IT A VENTI Life Crafted kit, as well as the beautiful Scrapbook add on kit. 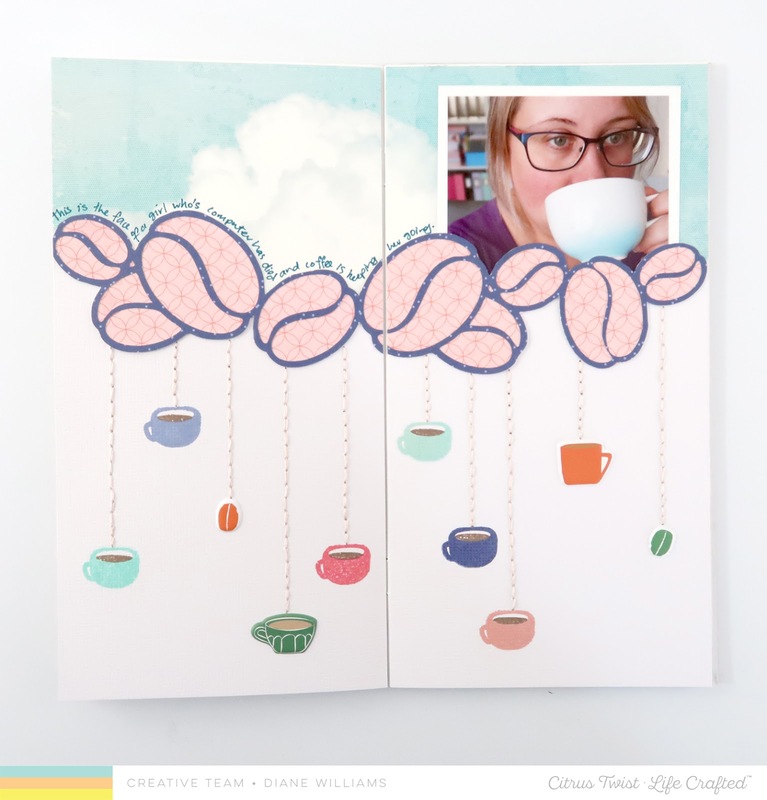 Then I got busy altering one of the subscriber-exclusive cut files to create a coffee bean cloud for my page! Once I had my coffee cloud all backed (in pink, of course! ), I added my photo onto a background of even more clouds! 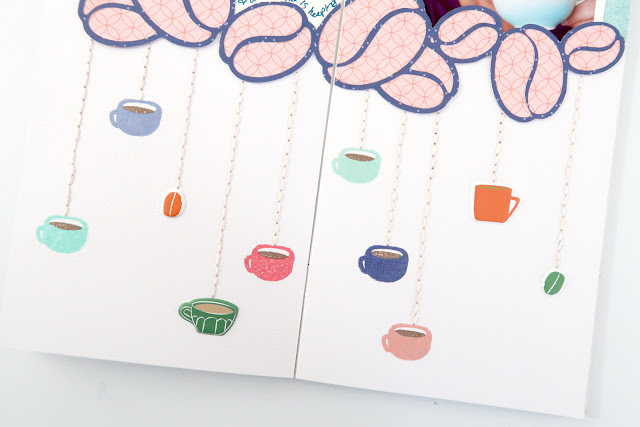 To create the effect of the coffee cups raining down, I added stamps and puffy stickers directly underneath the cloud and then stitched in some lines using light pink embroidery floss. The page was busy enough without adding a title, but I did want to a couple of lines of journaling. I wasn't sure where I could fit the journaling in, so I tested writing above the clouds by placing a piece of tracing paper over my page and writing the words in before I committed to placing it on the page. And it worked a treat! Have you got your April kit yet? How many coffee themed pages are you planning on making? I can tell you, I have no plans of stopping any time soon! I started by printing one of the digital TN papers to 8.5x11 size. My printer has the ability to print without borders (I'm not sure if everyone's does that, but my last printer certainly did not, so I take full advantage of this feature! ), so when I pull up the TN papers, I am able to select the print without borders option and get a full 8.5x11 sheet of patterned paper. I do this ALL THE TIME now. Lol. Anyway, I went with this pretty ombre wood grain paper since my son is wearing a blue shirt, I thought the photo would really pop off the page. 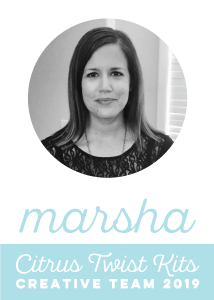 I kept my layout fairly simple, focusing on a vertical design with a smattering of embellishments. To add even more texture, I ripped the top and bottom of my page, tucked in some more patterned paper, and even a die cut up top, and then stitched the torn pieces down with some embroidery thread. Hi, Everyone! Patricia with you to share a Traveler's Notebook Challenge using the April Life Crafted Make It a Venti and the April Scrapbooking Add-On Kit. 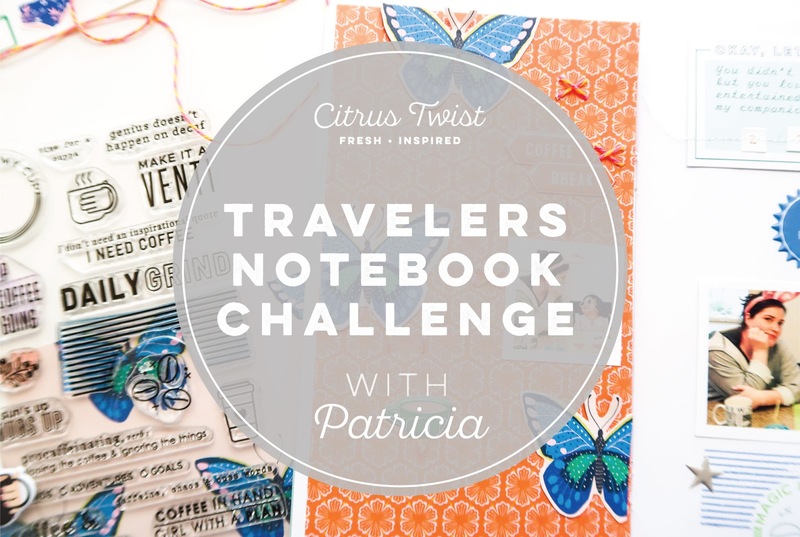 My challenge is to add some hand stitching to your Traveler's Notebook using the thread that comes in the April Scrapbooking Add-On Kit. Using the pattern paper from the Add-On Kit as inspiration for my stitching, I pierced and followed the design, changing directions and the kind of stitching, but staying within the pattern paper design. Then adhered this page into my TN album. 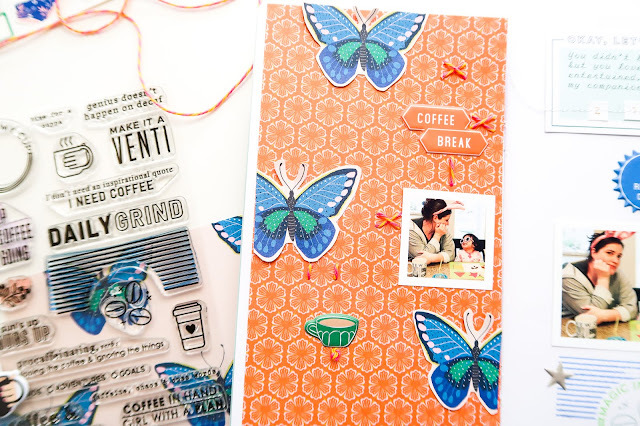 To finish this page, I fussy cut the butterflies from the Add-On Kit pattern paper to adhere along the edges, added my photo, and embellishments from the April Life Crafted Kit. For my right side, I placed my photo and stamped the April This is the Life "Daily Grind" stamp set under it. So many possibilities with this stamp set. I used three different inks and added stars from the April Life Crafted Kit. I used a die cut, more stamping, and the Exclusive Tiny Alphabet Stickers with Gold Foil from the Life Crafted Kit to type my journaling and add more stamping. I replaced the word 'coffee' with that adorable coffee cup stamp. It has three parts to it: the cup, the liquid, and the smiley face. Filled in the space between my photo and journaling with another Life Crafted embellishment to balance the blue on the left side. I stayed within the pattern paper for the handstitching, and even did a couple of French Knots, but I think this would also work directly on your pages if you double-up that page with a blank one under it, so you have a new page to work with without seeing the stitching. 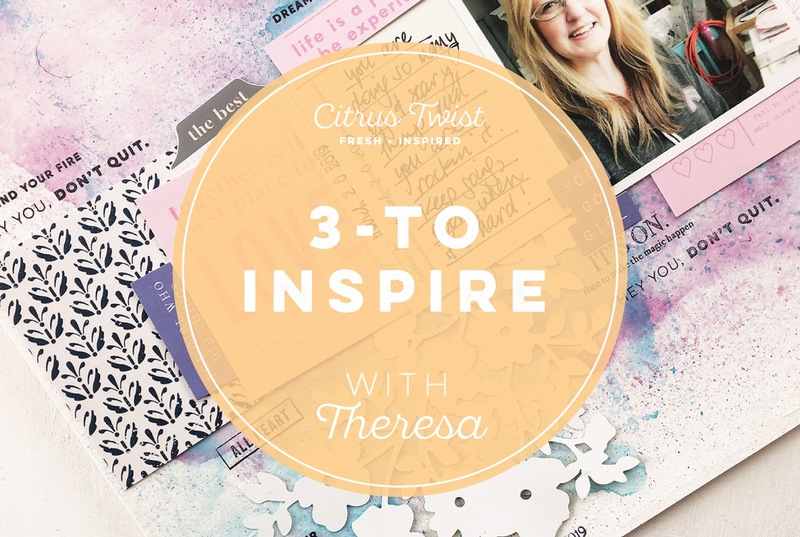 Add as much or as little handstitching to your next TN spread and share in the CTK Fan Page on Facebook and/or on Instagram using the tags #citrustwistkits @citrustwistkits so we can all see and leave a comment! I just divided the layout exactly in the middle . The gorgeous colors in the kit this month are perfect for my photos. I made my title using the different stickers from the kit . 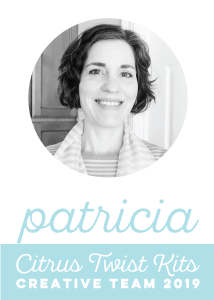 To get an even more layered feeling I add a few labels from the April digitals. 1. Mixed media background inspired by a patterned paper. I love creating quick mixed media backgrounds and using a patterned paper for inspiration is a great way to spark your creativity! 2. 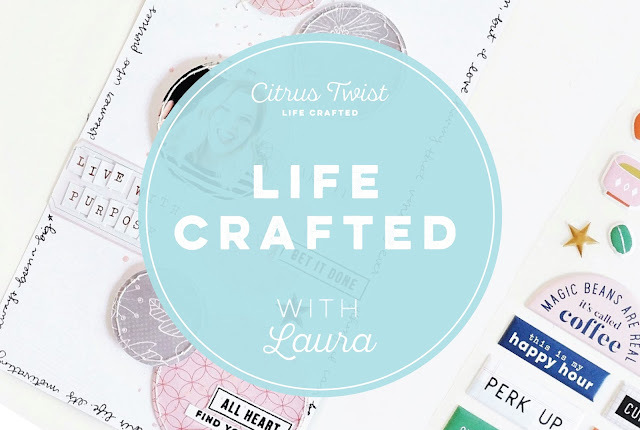 Use a cut file in an unexpected or unplanned way. For this layout I intended to use the patterned paper side of the cut file, but once I laid everything out realized I liked it better in white. I love the flexibility cut files give us! 3. 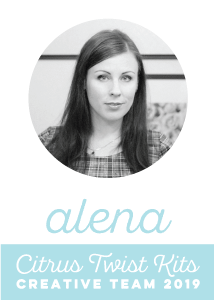 Use stamps to help tell your story. 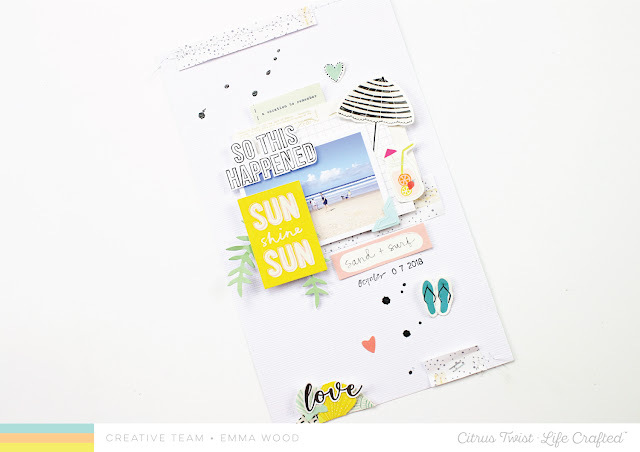 I was so inspired by the sentiments of the Traveler's Notebook stamp set this month and created this entire layout just to use them! 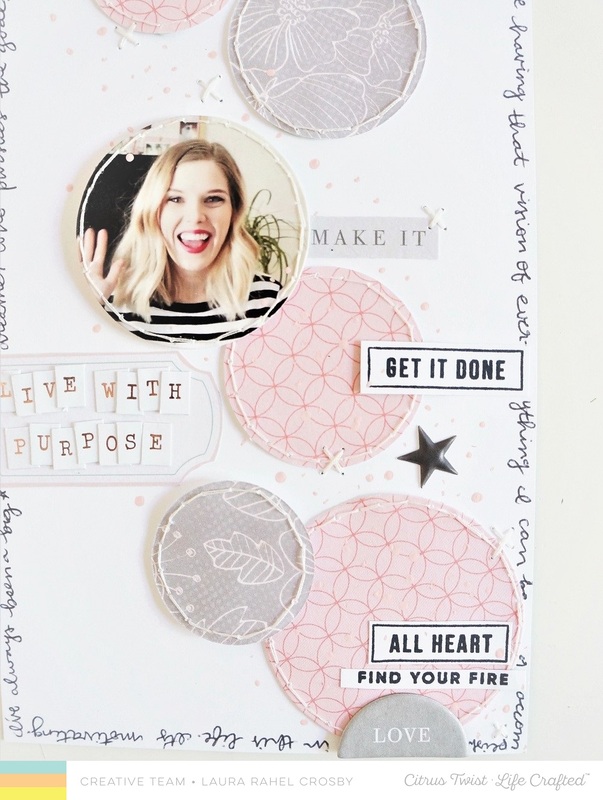 I think you will enjoy creating a layout that empowers you with these stamps! My layout today was inspired by the stamps and I knew I wanted to begin with a mixed media background. I have used the floral patterned paper below to inspire my colors for the background - pink and periwinkle. For my background I used India Inks and water on watercolor paper. I fell in love with the Floral Screen cut file this month! 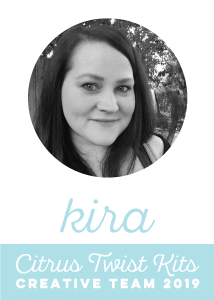 Originally I planned to use it with the patterned paper side up, but as you can see, the white pops against the background beautifully and allows those gorgeous florals to show so well! 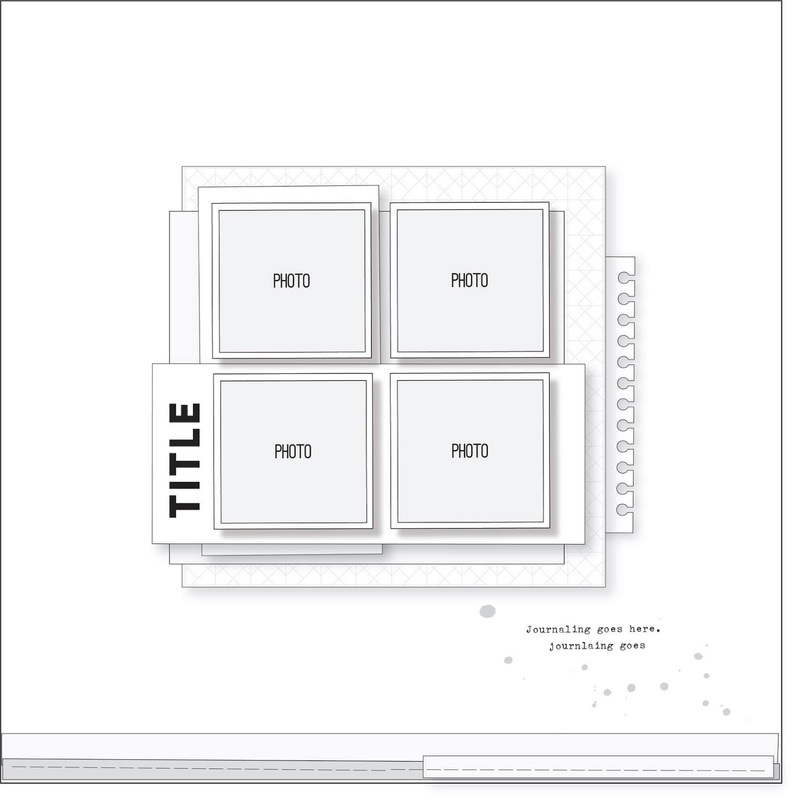 My basic design concept of this layout is very horizontal, with photos and journal cards going across the page. 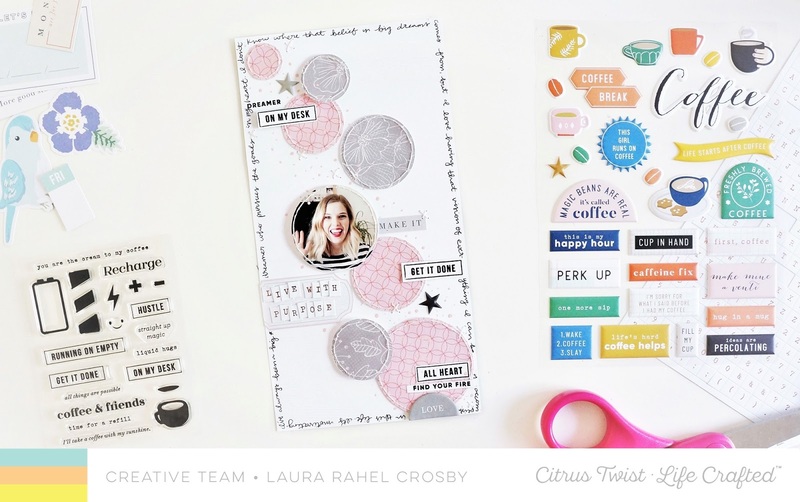 Everything else flows from this horizontal line, including the die cut, ephemera, and stamps. My favorite way to use stamps is with black ink against a mixed media background. They also serve as a home base for each embellishment cluster above and below the journal cards. Thank you so much for joining me today! 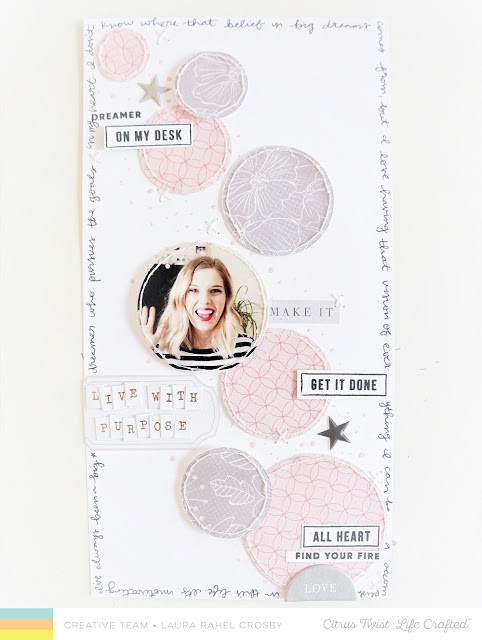 I hope you are inspired to create and cannot wait to see how you are using your Make It A Venti kits this month! See you again soon! Hey friends! 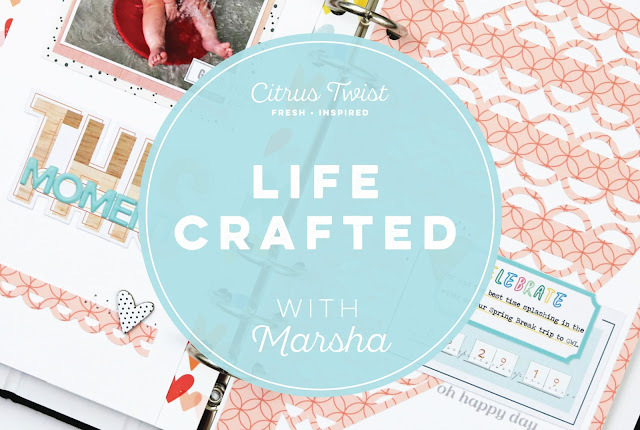 Marsha here again today, and I'm excited to be sharing a spread in my Life Crafted Album. 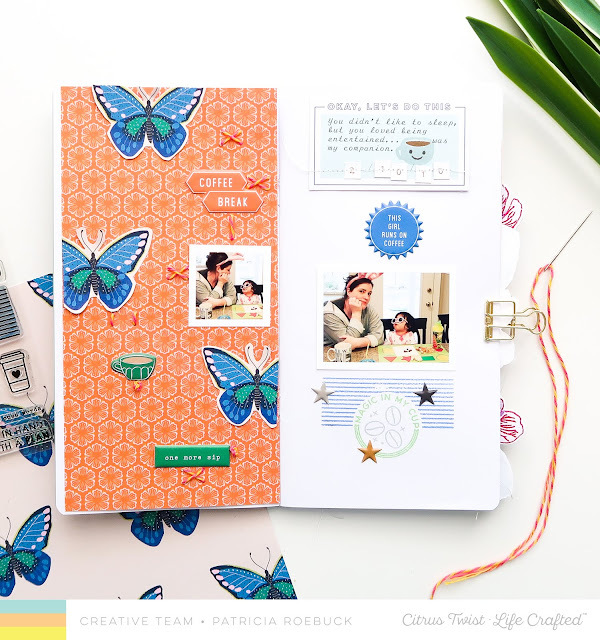 I used this month's Life Crafted "Make It a Venti" kit and the Life Crafted Stamp Add-on to create this layout. I just love the colors and designs in this kit! 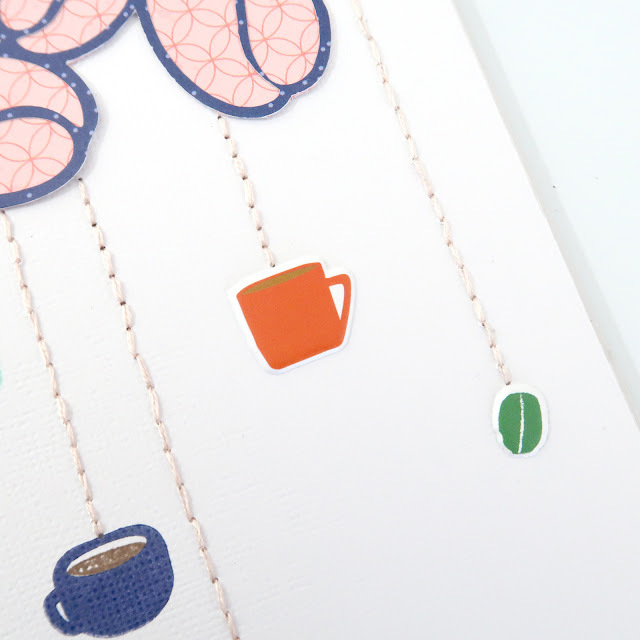 I also love that even though it is coffee themed, this kit can be used for lots of other types of documenting. 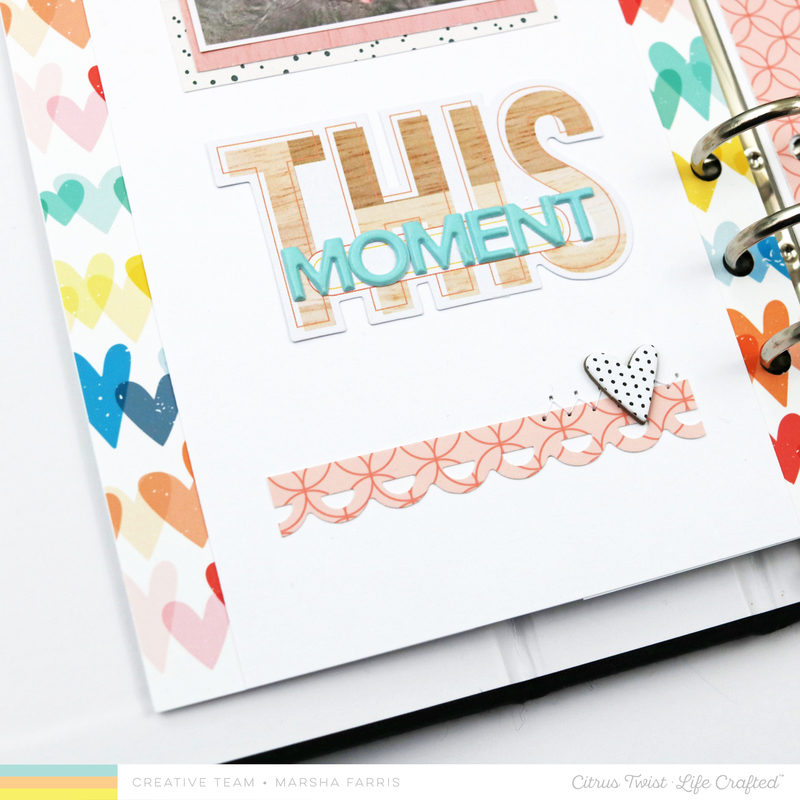 To begin the layout, I chose one of this month's exclusive cut files, "Retro Heart." 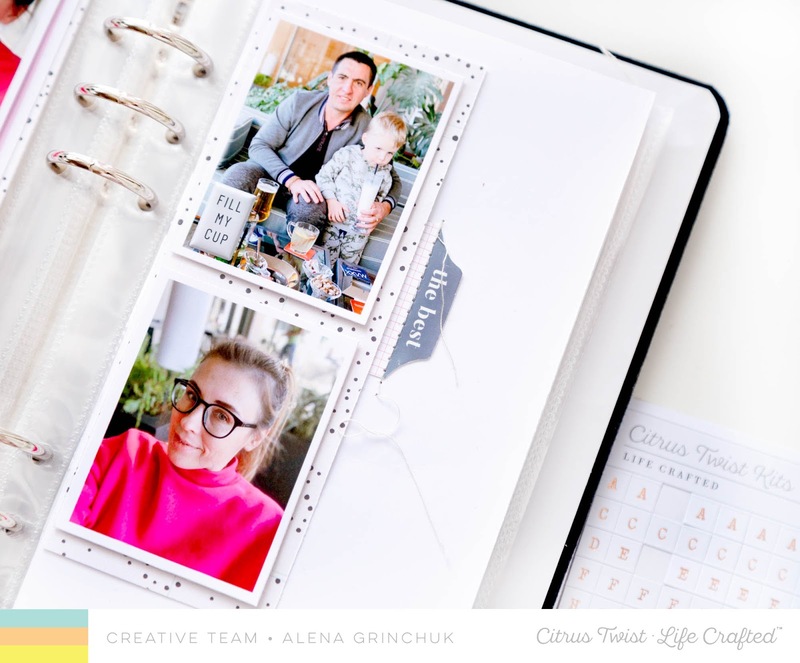 The best part about using this cut file is it's already sized to fit perfectly in the Life Crafted album! 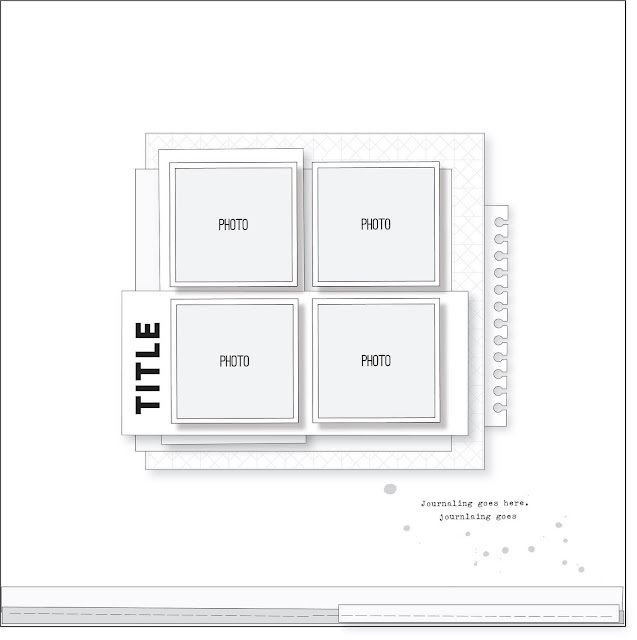 I resized one of the traveler's notebook digital papers using my Silhouette Studio software. By doing this, I was able to cut the entire file using patterned paper. I then layered the cut file over a white cardstock base. For my journaling, I chose one of the labels from the Make It a Venti Cut Aparts. I layered the label over an ephemera piece from this month's kit. The tiny tile alphabet stickers were perfect for adding the date. To finish off this side of the layout, I added a chipboard heart sticker from last month's Life Crafted "Life Chapters" Kit. For the other side of the layout, I printed another digital TN paper and sized it to fit in the album. I layered a piece of white cardstock down the center of the paper, so that the heart pattern was peeking out on both sides. 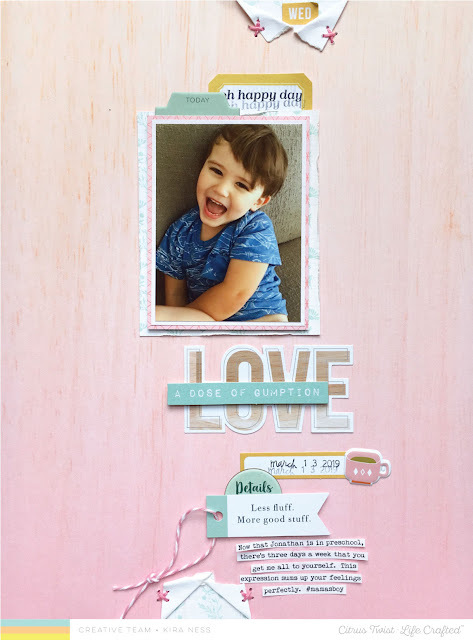 Next, I trimmed a few of the kit papers to layer behind this cute photo of my niece, and used some of the ephemera pieces from this month's kit to embellish this area. I hand cut a heart using the woodgrain paper and added it to the cluster. Using a border punch from my stash and the pink patterned paper from the kit, I cut a scalloped border piece and tucked it behind the photo. I saved another scalloped piece to add to the bottom of the page. I love how this mimics the scallop from the heart cut file! For my title, I chose the ephemera "THIS" die cut and added some of the puffy alphabet stickers from the kit. 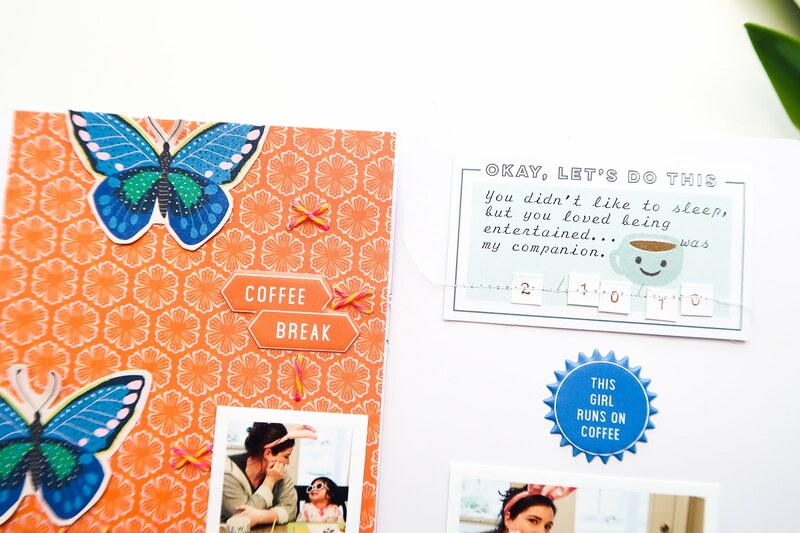 To finish off the spread, I added some machine stitching to a few areas of the layout, and I used the Life Crafted Stamp Add-on to stamp a couple of sentiments around the page. Thank you for stopping by today. I can't wait to see what you create using this month's Life Crafted "Make It a Venti" kit! 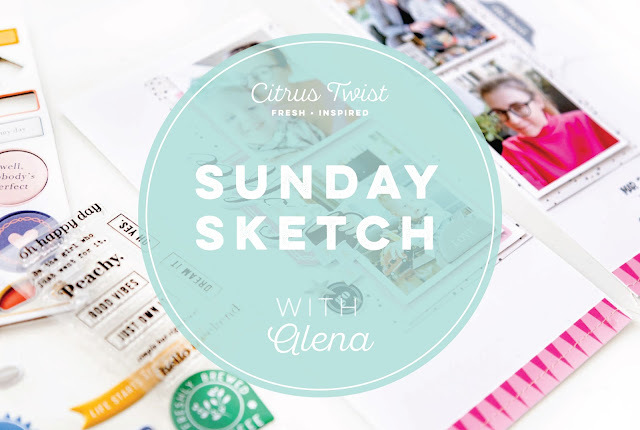 Sunday Sketch with Anna, Emma and Nathalie!